Sipping a glass of wine on the terrace last night, I thought about writing an article about proxies. I’ve become a bit obsessed about proxies, ever since looking at the way Learning Analytics seems to so often equate learning with achievement in examinations. But then by chance this morning I ended up looking at the text of Ivan Illich’s 1969 publication ‘Deschooling Society‘. And I found in the first chapter Illich talks about about how we “confuse teaching with learning, grade advancement with education, a diploma with competence, and fluency with the ability to say something new. This seems an apposite comment on how the use and analysis of big data is being developed in the present period. I have not seen Hypothes.is before but it looks pretty nifty. I have never understood just why collective annotation has never quite taken off. It seems to me a great format for sharing and developing knowledge together. 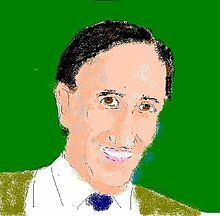 And I think Illich would have liked it. According to Class Central a quarter of the new MOOC users in 2016 came from regional MOOC providers such as XuetangX (China) and Miríada X (Latin America). XuetangX burst onto this list making it the only non-English MOOC platform in top five. In 2016, 2,600+ new courses (vs. 1800 last year) were announced, taking the total number of courses to 6,850 from over 700 universities. The European EMMA project is launching a webinar series. The first is on Tuesday 17 November 2015 from 14:00 – 15:00 CET. They say: “In this first webinar we will explore new trends in European MOOCs. Rosanna de Rosa, from UNINA, will present the philosophy and challenges behind the EMMA EU project and MOOC platform developed with the idea of accommodating diversity through multilingualism. Darco Jansen, from EADTU (European Association of Distance Teaching Universities), will talk about Europe’s response to MOOC opportunities. His presentation will highlight the main difference with the U.S. and discuss the consequences for didactical and pedagogical approaches regarding the different contexts. My recent posts have been reports on the Bremen International VET conference (2.9.-4.9.2015). The very next week many of the participants met again in the European Conference on Educational Research (ECER’15) in Budapest (8.9.-11.9.2015). Here again, I will start my reporting on the session that was initiated by our EU-funded Learning Layers (LL) project. Then, I will give reports on some other sessions that were based on similar intervention research projects. Finally, I will make some comments on the conference (or on the program of the VETNET network) as a whole and on the general assembly of the VETNET network. This year our plan was to have a joint symposium between the LL project and two neighbouring projects – the German project “Kompetenzwerkst@tt” and the European project “Employ-ID” with which we already had a joint session in the Bremen conference (see my previous posts). We also took into attention the conference theme “Education and transition – contributions from educational research” and developed our own ideas, how this could be applied to the three projects that we brought into joint session. For us – in this session – transition was related to evolution of project ideas and conquering new terrains for research & development work. Originally we had submitted another proposal for a research workshop to discuss evaluation issues in complex European projects that promote users’ competences in digital media, web tools and mobile technologies. Due to clashes with other duties we had to withdraw this session (with the hope that we can get back to this topic some other time). We started with the Kompetenzwerkst@tt project that has the longest history to build upon. The literal translation “Competence workshop” hardly reveals the project idea and the connotative meanings of ‘competence’ in German language. Initially, the project started as a curriculum development project to base vocational learning on holistic approaches to occupational fields of activity (Handlungsfelder) and characteristic Working and Learning Tasks (Lern- und Arbeitsaufgaben (LAAs)). The process of analysing the fields of activity and specifying characteristic WLTs had been practiced in different occupational contexts and in transitional training contexts. This had led to the phase of preparing a series of handbooks covering the conceptual foundations, the methodologies, different spin-off innovations and the occupational fields that have been piloted so far. In the presentation of Falk Howe and Werner Müller (both from ITB) the main thrust was given on the development of e-portfolios in the context of the Kompetenzwerks@att approach. They gave a brief overview of the previous stages of the project and then illustrated, how the previous work (on the fields of activity and working and learning tasks) was reflected in the structure of software and in the pedagogic support for learners. In this way we got an idea, how the e-portfolio can be used in retrospective sense (for documenting already acquired experiences and learning gains) and in prospective sense (for shaping and illustrating learning scenarios). In the case of our LL project we had a shorter project history as our starting point. In our case we had started with our pilot activities in the construction sector with the training centre Bau-ABC with special attention on apprentice training. Therefore, the co-design processes that we initiated were firstly focusing on digitisation of training/learning materials. Then, in a further iteration we shifted the emphasis to Learning Toolbox – a framework for managing contents, apps, web resources and communications via mobile devices. Now, in the current phase of project (when we still have to do a lot of field testing and exploitation of results) we need to look for spin-off projects. In our joint presentation I covered firstly the work within the LL project and gave a picture of its evolutionary phases. Then I gave some insights into the Learning Toolbox and its functionality and into the search for appropriate spin-off projects with emphasis on continuing vocational training (CVT). In the second part of our presentation Ludger Deitmer gave an overview on the CVT framework in the German construction sector with three different levels: Foreman (Vorarbeiter), Specialised site manager (Werkpolier) and general site manager (Geprüfte Polier). In our current project initiative we focus on the new training regulation of the general site managers. In addition to their traditional introductory courses they are required to complete situational tasks and a comprehensive project report. With these last mentioned tasks they are expected to demonstrate their occupational and managerial competences. In the third part of our presentation Werner Müller discussed some restrictions, barriers and challenges to our project work in construction sector (in general) and in the learning contexts of apprentices and more advanced craftsmen. He concluded the presentation with an innovation map (to guide us) and with some open questions. Employ-ID piloting with MOOCs for Public Employment Services – lessons for others? The third project in the symposium – Employ-ID – focuses on the changes in the public employment services (PES) in Europe (with major pilots initiated in the UK). The background of the project is in the changing role of PES organisations due to changes in working life and occupations. Whilst the previous model was to select and guide the right people to appropriate jobs, the current changes have shifted the focus completely. Now these services are required to produce and process data of changing labour markets and employment prospects for different target groups and stimulate initiatives for employment and self-employment. Moreover, they are required to prove their efficiency and to cope with policies towards privatisation or semi-privatisation. Yet, they are to comply with the strict guidelines of data security and data protection. In the light of the above Graham Attwell had to give us a lot of background information to bring us to the central theme of his presentation – to pilot with adapted MOOCs (Massively open online courses) in the British public employment services (as the first pilot). This mode of staff training was selected since the time pressures and financial constraints are making it difficult to implement traditional forms of staff training. Moreover, it appears to be difficult to make use of (individual) learning gains in an organisational context. From this point of view the project team participated in external MOOCs and then designed a pilot MOOC with a more interactive and discursive nature. In the implementation the number of participants and the openness of pilot were reduced. 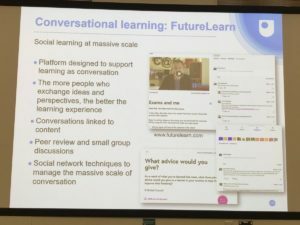 Yet, the technology of the major British MOOC provider Futurelearn was used. Altogether the pilot seemed to have been well received by the participants due to its actively interactive character. Yet, the participant’s report by Jenny Hughes (who had been involved both as a trainer and as a learner) indicated that the current technology still is far from mature stage. Altogether, it appeared that we had gathered into a joint symposium three projects that have a lot to learn from each other. This is even more striking since the persons are working side by side or (as some of us are) crossing the boundaries of the two projects. We noticed that the e-portfolio application of Kompetenzwerkst@tt very well complements the Learning Toolbox. We also noticed that the functionality of Learning Toolbox may essentially enhance the Kompetenzwerkst@tt. And the lessons from the pilot MOOCs are important insights for the forthcoming pilots in vocational education and workplace training. I think this is enough of our symposium. In the next blog post I will focus on similar sessions with interactive research and ‘stealthy’ interventions. 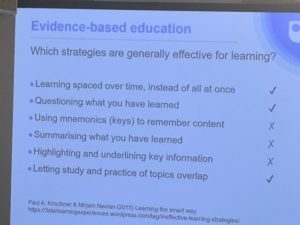 My recent blog was about a field visit to training centre Bau-ABC (2.9.2015) in the context of the fieldwork of the EU-funded Learning Layers (LL) project. The very next day the ITB and Pontydysgu teams, together with Raymond Elferink (RayCom) presented Learning Toolbox at the Bremen International Conference on Vocational Education and Training (VET). This post will focus on this session, the next one on other sessions of the conference. Firstly, it is worthwhile to say some words of the Bremen International VET Conference. This conference has been initiated as part of an international project of ITB that has been launched by the University of Bremen (in the context of its Excellence University framework). The project studies transfer of the dual VET model by German companies working abroad (in China and in the USA). As a part of its work program the project has committed itself to organise international conferences. This one was the first of its kind and focused on crossing the boundaries and learning from each other. The conference was designed to keep it rather small (about 100 participants at the maximum) and to enable more discussion and more participative sessions (see below). I will give more information on the contents in my second blog post on this conference. Firstly, I gave a quick introduction to the Learning Layers project and to the script of the session. In this context I emphasised the continuity of themes between the participative design of Learning Toolbox (LTB), the functionality that is coming up in the LTB, the capacity building measures initiated in the training centre Bau-ABC and the lessons to be learned from the parallel European project Employ-ID (and its piloting with Massive Open Online Courses (MOOCs). Secondly, Werner Müller (ITB) gave a presentation on the co-design process that led to the development of the LTB. He referred to the starting points in the sectoral pilot contexts (construction work not having the reputation of high-tech occupations). Then he gave a picture of the co-design activities, different phases of work and a general characterisation of LTB as a framework for tools and apps linked to each other in mobile devices. Thirdly, Raymond Elferink (RayCom) gave a live demonstration on the LTB Beta version that we had just presented and tested on our field visit to the training centre Bau-ABC the day before (see my previous blog post). Alongside the general presentation (of the tile structure of the framework and of the process of creating focused stacks) he drew attention to the newly created stacks of the Bau-ABC trainers for their respective trades. Fourthly, I (as a replacement of Melanie Campbell from Bau-ABC) gave a presentation of their training programs for their staff. This presentation drew attention firstly to the project-initiated training that equipped the Bau-ABC trainers with general know-how on multimedia and web tools and enabled them to produce and edit video material for their training. In the second part the presentation outlined the new training model initiated by the Bau-ABC trainers themaselves. In this new model they tried to ensure a flexible training arrangement that enables all trainers to work their way through parallel “theme rooms” that make them fit to use the LTB in their own training activities. Fifthly, Graham Attwell informed of the parallel European project Employ-ID and its work to support professional development and mastery of changes in Public Employment Services (PES). In this context the research & development worked with development of labour market data for guidance and counselling purposes. At the same time the project developed new training models for staff members in PES with limited possibilities to participate in traditional training measures. For this purpose the project developed an adapted version of Massively Open Online Courses (MOOCs) with limited participation and limited openness but with similar technologies for online learning. Crucial for this pilot was the emphasis on interactivity and changing roles between trainers and learners. 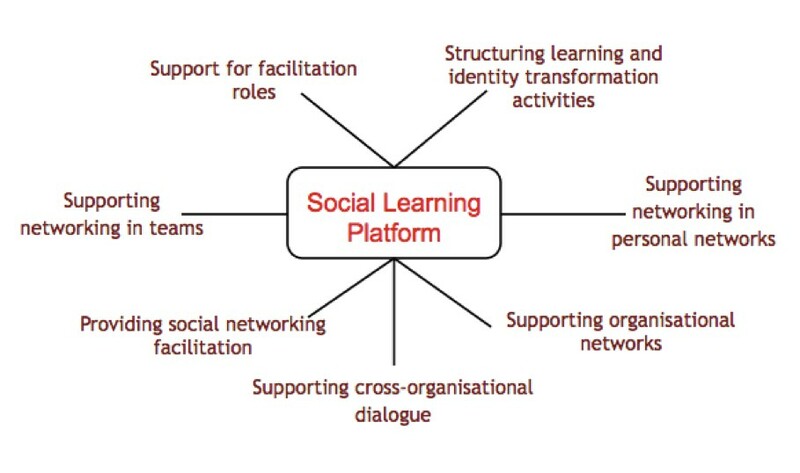 Here, the key point in this report on this recent pilot is to demonstrate the usability of these technologies for well-thought pedagogical pilots that emphasise the use of MOOC platforms as Social Learning Platforms. After the presentations we split the audience into two working groups. In one group the participants had the opportunity for hands-on tests with the LTB (with Raymond Elferink and Dirk Stieglitz as tutors). In the other group we discussed possible success factors and criteria for acceptance in the above presented training models (of Bau-ABC and Employ-ID). Since we had half an hour for these sub-sessions, the participants could engage themselves in the testing and/or give freely their views on the training models. This was very much appreciated by all parties involved. I guess this is enough of the main session of the Learning Layers project in this conference. In the next blog post I will give insights into other sessions in the Bremen International VET Conference. One of the aims for research and development is to introduce the use of Learning Analytics within Public Employment Services. 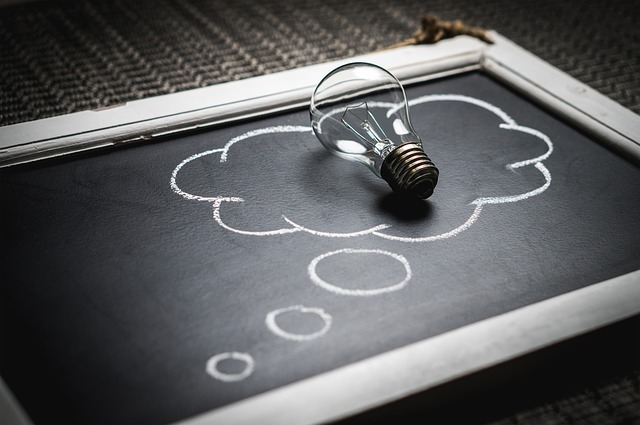 Although there is great interest in Learning Analytics by L and D staff, there are few examples of how Learning Analytics might be implanted in the workplace. Indeed looking at research reported by the Society for Learning Analytics Research reveals a paucity of attention to the workplace as a learning venue. 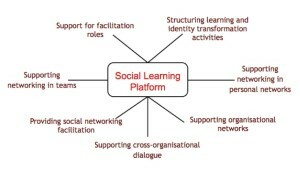 In this video, Graham Attwell proposes an approach to Workplace Learning Analytics based on the Social Learning Platform model (see diagram) adopted by the Employ ID project. He argues that rather merely fathering together possible data and then trying to work out what to do with it, data needs to be sought which can answer well designed research questions aiming to improve the quality of learning and the learning environment. For some of these activities we already have collected some “docital traces” for instance data on facilitation roles through within a pilot MOOC. In other cases we will have to think how best to develop tools and approaches to data gathering, both qualitative and quantitative. The video has been produced to coincide with the launch of The Learning Analytics Summer Institute, a strategic event, co-organized by SoLAR and host institutions and by a global network of LASI-Locals who are running their own institutes.